manila fashion observer: Death of the Skinny Girls? Death of the Skinny Girls? 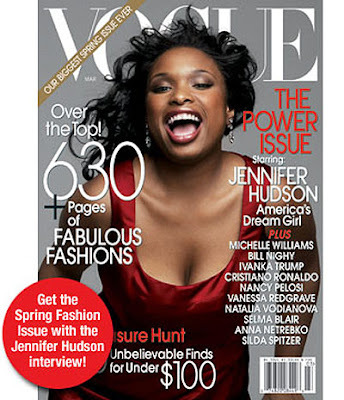 "When it rains, it pours" should best describe Jennifer Hudson's career right now. After winning a Golden Globe and a Screen Actors Guild award for "Best Supporting Actress" for her role in Dreamgirls, she got an Oscar nomination to boot! Now, she's zoomed past Beyonce and made it to the cover of the March issue of Vogue, a feat considering that she is the first African-American singer to do so! And as if to break all records, she is the first "full-figured" woman to grace the coveted cover of all covers! Does this mean Vogue is now willing to forego skinny actresses and models for "real women"? Maybe if this issue sells out and sales figures show the MIS folks at Vogue that women of the world have seen enough of the skinnies! to tell the world the truth, id rather the fashion world still cling on skinny girls as their mannequins..